Sun n Snow Inn is a luxury hotel in Kausani offering invigorating views of the Himalayan peaks in Kausani. Located amidst thick pine trees, Sun n Snow Inn is one of the most popular hotels of Kausani amongst visitors. 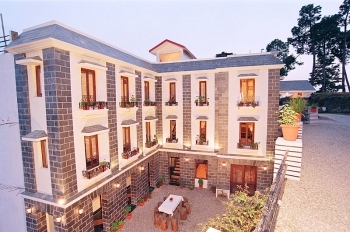 The resort is service oriented providing comfortable and luxury accommodation with quality food. Sun n Snow Inn of Leisure Hotels is a small but artistic hotel. It is enveloped in an old world aura equipped with modern amenities and comfort. The proficient staff of the Sun n Snow Inn is always ready to serve the guests round the clock. Hotel Sun n Snow Inn is located near Anashakti Ashram, one of the most famous tourist spot in Kausani. The hotel provides the unobstructed view of majestic Himalayas and valleys. Sun n Snow Inn in Kausani, serves 12 luxurious rooms and 1 Suite, which are fully equipped with modern amenities facing the invigorating Himalayas. All the rooms have wooden floors, dressing table, sofa chairs, satellite television, window couch, luggage rack and cupboard. The bathrooms are sanitized with amenities such as soap, towels and geyser. It also provides a family suite which is ideal for a group of four or a small family. All the rooms are provided by 24 hours running hot and cold water. Hotel Sun n Snow Inn offers a variety of food for avid food lovers. The hotel offers a multi cuisine restaurant which serves a choice of Indian (North Indian, Gujarati, South Indian & Kumaoni), Chinese, and Continental cuisines. The interiors of the restaurant are alluring. The paintings, fireplace, crockery, food everything adds to the ambience of the restaurant. Enjoy outdoor sports like rock climbing, rappelling, river crossing and short treks with Sun and Snow Inn. Visit Anashakti Ashram to known in deep about Mahatma Gandhi. Visit the nearby sacred temples of Baijnath, Nanda Devi temple, Kalika Temple, Kosi Katarmal Temple etc. Sun n Snow Inn offers exclusive services for planning and organising business events to corporates. The hotel provides professional business conference, seminars and corporate meetings. Sun n Snow Inn in Kausani is well connected by motorable roads. Buses and taxis to Kausani are easily available from major towns of Uttarakhand state. It is situated 180 kms from Pantnagar Airport and 142 kms from Kathgodam - the nearest railway station from Kausani.